As much as we want to romanticize or idealize childhood, children live in the real world—the same beautiful and broken world we adults inhabit. Through his writing, Dr. Timothy Paul Jones regularly reminds me that it’s the Bible’s storyline that helps us look at our world holistically, that is, in a way that keeps together what we often perceive as separate childhood or adult realities. “The Bible should frame every aspect of our lives—including family life,” Jones says. In other words, a biblical worldview must shape the way I view children. Theologians often summarize this biblical lens as a fourfold movement: creation—fall—redemption—consummation. What does this storyline framework teach us about kids? First, our children are created in God’s image. My daughters are fearfully and wonderfully made. Their lives are imbued with the glory of a universe that reflects God’s beauty. God and their mom’s genetics have given them some athletic ability. My girls have been endowed with imagination and an ability to think and know. A child’s life has value because he or she is made in God’s image. Second, our children are fallen. Even children are but dust. They experience the pain of a world marred by sin, abuse, suffering, and death. Rob Plummer writes, “Sometimes, people talk about coming from dysfunctional families. The reality is that, because of sin, we are all ‘dysfunctional’ at the deepest level.” My daughters need comfort, care, and a healing touch. And when they exchange delight in God’s glory for delight in the pleasures of the moment, they need discipline and correction as well. Third, our children need Jesus to save them. They need redemption. Jesus himself says, “Let the children come to me. Don’t stop them! For the kingdom of heaven belongs to those who are like these children” (Matthew 19:14 NLT). Jesus’ words should encourage us to call children to him. His words should inspire us to help them see that his good news is their only hope. Finally, in light of the coming consummation, our children are potential brothers and sisters in Christ. If my daughters stand beside me in the new heavens and new earth, it will not be as my daughters but as my blood-redeemed sisters. To be embraced by God’s redemption is to be adopted as God’s child, gaining a new identity, which transcends every earthly status and relationship. This simple outline seems pretty basic. But if I’m honest, I have to admit I tend toward the more fractured way of looking at ministry and parenting. I struggle to believe that every part of the biblical message applies all the time. As a dad, I know that I’m responsible for protecting my kids, caring for their bodies, providing for them, and teaching them to make decisions that will lead to a more successful life. These are responsibilities that correspond to the truth I know from a doctrine of creation, humanity, and the fall. But it’s easy (even as a pastor) to neglect the doctrines of redemption and consummation when I’m at home. You’ve probably heard family ministry leaders complain about parents who have a ‘drop-off mentality.’ Many parents assume the responsibility for evangelizing and training children is best left with clergy. As Jones writes, “School teachers are perceived as the persons responsible to grow the children’s minds, coaches are employed to train children’s bodies, and specialized ministers at church ought to develop their souls.” There’s no doubt this is a problem, but I wonder if the trouble runs even deeper. Even if I regularly discipline, instruct, and encourage my daughters to pursue what is pure and good, how often do I think about them as potential sisters in Christ? I can help them recognize the right path and seek to restore them when they veer onto the wrong path. When I am disciplining one of my girls, I may even go beyond misbehavior and shepherd her heart motivations. But like an older brother in Christ, am I willing to confess my own sin and repent before my daughters as well? If not, I’m in danger of being a graceless dad. An equal but opposite temptation beguiles me as a pastor. Because evangelism and discipleship are chief parts of my job description, I’m tempted to embody the role of an elite fixer. In the midst of preparing lessons and managing programs, I too easily forget that God has called me to equip parents to evangelize and teach their own children. Beyond that, I tend to forget just how hard it is for parents to live out the doctrines of redemption and consummation before their children when so many other things dominate their time. Field hockey practice, allergy shots, carpool, and the school Christmas party (not to mention a broken leg, a broken marriage, or unemployment) tend to push ideal times of family worship to the side. If I lack an awareness of the real needs parents in our church experience each day, then the gospel I’m preaching is essentially a gnostic one, that is, a spiritual message that is abstracted from embodied life in the real world. Praise God for a Savior who doesn’t struggle with seeing ministry through only one or two parts of the biblical storyline. In Christ Jesus, God became man and lived among us. He united our beauty and brokenness in his flesh. He brought redemption, and he’s bringing about the consummation of the kingdom through his church. I’m particularly thankful for some renewed ways evangelical churches are living out Christ’s more holistic ministry in our time. Renewed emphases on orphan care and social justice for children, for example, help us fight against a graceless or over-spiritualized life. My prayer is that family ministry in our churches embodies the truth of every part of the biblical storyline. I pray that we have more grounded ministry that helps leaders move from merely ‘running a department’ or ‘leading a bunch of programs’ to truly ministering to families in a way that better images forth the Savior’s mission. Write the words Home and Church on a white board. Draw a gap in between. Under Home, write the particular parts of the biblical storyline that are typically emphasized by parents—Creation and Fall—as well as the danger—Graceless Family—when our focus is on these parts of the storyline in isolation from the end of the story. Under Church, write the particular parts of the biblical storyline that are typically emphasized by pastors and ministry staff—Redemption and Consummation—as well as the danger—Overly Spiritualized Ministry—when our focus is on these parts of the storyline in isolation from the beginning of the story. Next, use yellow sticky notes to write down the various programs your ministry offers (VBS, small groups, family fun night, leadership training, discipleship retreats, midweek, Sunday school, youth camps, etc.). Use a different note for each program. Place these notes on the board under the word Church. Next use a new color of sticky notes to write down the real needs or struggles of individuals and families in your ministry (such as depression, loneliness, divorce, drug or alcohol abuse, inappropriate sexuality, apathy, anger, etc.). Use a different note for each need or struggle. Place these notes on the board under the word Home. Draw a line from each yellow note to each of the needs that particular program meets or addresses. Circle the sticky notes that remain, and ask the following questions: Why are there unmet needs in your current ministry structure? How might those needs be met considering your limited financial or people resources? Can you partner with other churches or para-church ministries to match their ministries to the needs of your church? Or why do you have a program that isn’t meeting the specific needs of your church? How can you use these programs to help other churches in your area? 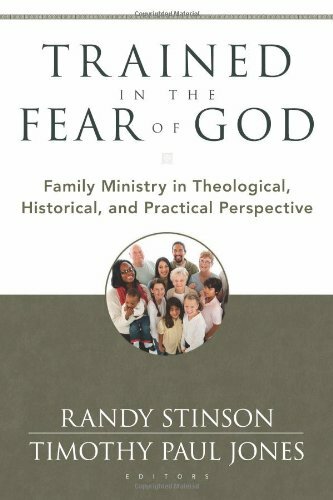 Rob Plummer, “Bring Them Up in the Discipline and Instruction of the Lord,” in Trained in the Fear of God: Family Ministry in Theological, Historical, and Practical Perspective, edited by Randy Stinson and Timothy Paul Jones (Grand Rapids, MI: Kregel, 2011), pp. 45-59. 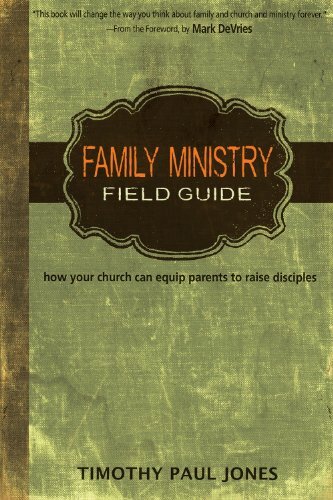 Timothy Paul Jones, Family Ministry Field Guide: How Your Church Can Equip Parents to Make Disciples, (Indianapolis: Wesley Publishing, 2011). 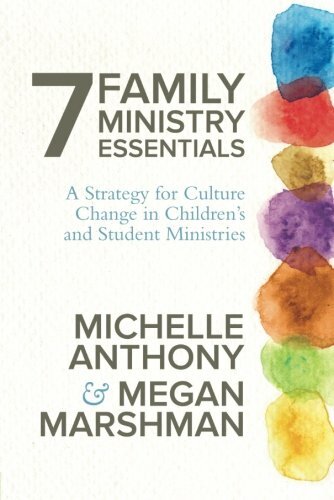 Michelle Anthony and Megan Marshman, 7 Family Ministry Essentials: A Strategy for Culture Change in Children’s and Student Ministries, (David C. Cook, 2015).